Here at Ceres Psychological Services it is our objective to assist parents in fulfilling their role as advocates for their child's special education. On this site you will find articles and information that will answer all your questions old and new about learning disabilities and the process of enrolling your child in special education. The laws that govern special education make parents fully responsible for the education of their children, and children with learning disabilities have a very difficult time in school if their parents are not involved. The role of the parent in the special education process is so important, that some courts appoint volunteer advocates to fulfill this role. While in our efforts we focus upon the law, we are Licensed Educational Psychologists, not Attorneys-at-Law. Still, we hope to support parents with information that will help them to understand the law and utilize that information to explore educational alernatives to meet the needs of the child with learning disabilities and other special needs. Initial emphasis is upon gaining an understanding of learning disabilities so that you can better master the challenges they present to the child, the family and the school. 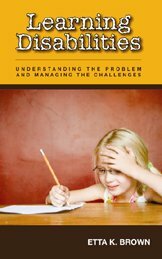 Parents are encouraged to empower themselves with the step-by-step information needed to meet the challenges presented by the child with learning disabilities, and to solve problems and find solutions during the design of an appropriate individualized education plan. The parent advocate is advised what to do and how to do it, what to say and when to say it, questions to ask, and what to do if you don’t get the right answer. An electronic version (ebook) is available for international orders and others who may prefer a digital copy. Look for an immediate email from Pay Pal with a link to the download.